Think like a horse. Can't be too hard, right? Actually, it takes time and training. Nationally-known trainer Kenny Harlow visited the Bryan area May 29 - June 3 for his "Training with Trust" Clinic at the RAMM Training Center on County Road 10. Harlow is known to many as the "real life horse whisperer," though he humbly brushes off the title. "I think I can teach anyone to do what I do," he said. Shows like "Hard Copy" and "NBC Today" featured Harlow on television after the movie "The Horse Whisperer" was released because he is known for working with problem or unbroke horses. On the "Today" show he proved his skills by taking a random unbroke horse from a field and having it ready to ride after only a few hours. But Harlow still contends that there is no "whispering" involved. 'I told them I'm not a horse whisperer. i teach people and I teach horses," he explained. Harlow kicked off his five-day clinic doing a demonstration with his own horse, Dozer, and taking questions from the crowd. Debbie Disbrow of the RAMM center said around 40 people attended the first day. On the second day, Saturday, Harlow had a problem and unbroke horse clinic. This is what he's most known for, and horse owner's from around the country bring their horses for this portion of the clinic. Harlow invited spectators to watch as he worked with a horse in a roundpen. His assistant, Tara Jones, explained that roundpenning allows him to gain control of the horse's movement. He finds the root of the animal's problems first, then works to correct them. "We can do something within two hours usually," Jones said. But the horse isn't "fixed" at the end. Harlow gives the owner the tools to continue working with the horse at the end of the session. He loves seeing the owners react from a session of working with problem or unbroke horses. "It's the satisfaction of bringing the horse into that pen ... then you see the look on their face afterwards," he said with a grin. Harlow's methods are calm, nurturing and diligent. 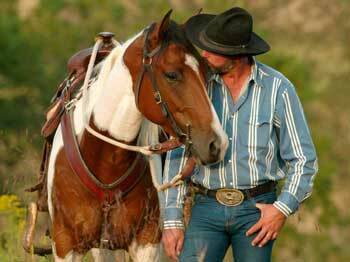 He has a soft voice from under his cowboy hat as he speaks with the owner and horse during a roundpenning session. In fact, he has to wear a microphone so spectators can listen. He said the problem with most trainers is that they are focused on the end result rather than the process. "They like to get to the goal instead of seeing how many steps it will take to get into it," he explained. 'I break it down into small steps so a kindergarten student could understand it." For the remainder of the clinic, Harlow worked with riders of all levels. Jones explained that in every riding clinic, beginners to Olympians relearn how to to ride. "For the most part, everyone ends up at the same place in the end," she said. "Kenny is a great teacher because he doesn't judge you from where you've been, but he helps you get where you want to be." In addition to doing clinics around the country, Harlow offers many other training opportunities at his Cedar Run Ranch in Cumberland, Va. Jones explained the ranch offers apprenticeships and certifications for those looking to become professional trainers. 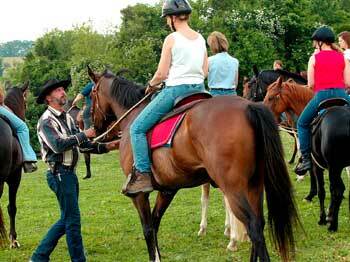 There are also vacation and camping options for a more relaxed horse experience. Sandy Moulds, a national-champion horse rider who attended the Bryan clinic, said she has been working with Harlow for eight years and has learned more than she thought possible. Her mother was a professional trainer, and Moulds was sent to train with a member of the Yugoslavian Calvary when she was a girl, so she knows a thing or two about riding. But, she said, Harlow gave her the missing piece: how to handle horses. "He just taught me a way to think like a horse," she said. That's easier said than done for most people.